etj_ghostPlayersFadeRange controls distance when ghostplayer starts to fade. Custom vsays: /vsay <variation> <id> <custom text> e.g. /vsay 4 hi Good evening!. etj_chatFlags toggles team flags next to chat messages. Specs can no longer vote. Votes will stay for full 30 seconds unless the percentage needed out of number of connected clients has exceeded for either yes or no votes. For example: 51% => 2 players are in team, 2 in spec => 3 votes are needed. If both players in team vote yes it will wait for 30 seconds and pass. If one of the specs join team vote yes, it will pass instantly. If one of the specs join team and vote no, it will wait for the vote to expire and pass. Fixed a bug in listbans. Well here we are, I was supposed to make a better quality and edited movie, but I ran out of motivation after trickjumping extensively for months. I figured if I don't finish this movie now, I never will. Some FRAPS clips were laggy. Trickjump movie made by Stuns and performed by himself - This is a Wolfenstein: Enemy Territory trickjump video. You will see recordings I collected over the years accompanied by music mixed together by myself. I do not claim that any original in this movie is new, thus the title "Oldriginals". This is my last trickjump movie, please enjoy. 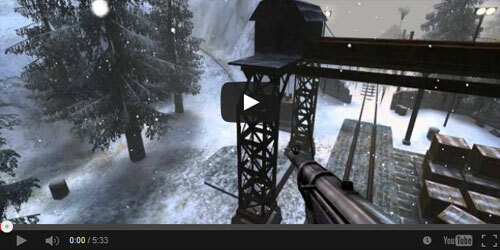 Ein Trickjump Film, erstellt und gespielt von Stuns - Dies ist ein Wolfenstein: Enemy Territory Trickjump Video. Du siehst Aufnahmen von mir, die ich im Laufe der Jahre gesammelt und mit Musik gemischt habe. Ich behaupte nicht dass alle Originale in diesem Film neu sind, deswegen der Titel "Oldriginals". Dies ist meine letzter Trickjump Film, genieße ihn! Movie 2: Enasni 1.3 by Evo / sunBurn. Video by IceQ. Thanks to all the trickjumpers that keep it alive! ETJump 2.0.4 is ready! Everything that I wanted is not in but as there were quite a few bugs that caused crashes I decided to release it already. Fixed a bug that caused vote_limit to be ignored. Fixed a bug that caused axis engineers to spawn with rifle nades when noexplosives was active. Added random map mode (g_randomMapMode where the server automatically changes map every X minutes (defined in g_randomMapModeInterval). Voting for the mode can be toggled with vote_randomMapMode cvar. Fixed a rare bug that crashed the server on random map vote. Fixed a bug that teleported players to random locations on load after map change. Added player_drawMessageTime cvar for logging time when the chat message was sent. Setting the cvar to 1 will print [hour:minute] ETPlayer: hello, world! and setting the cvar to 2 will print [hour:minute:second] ETPlayer: hello, world! Slick detector now detects slickly slopes aswell.